Member tested and recommended by the National Home Gardening Club! 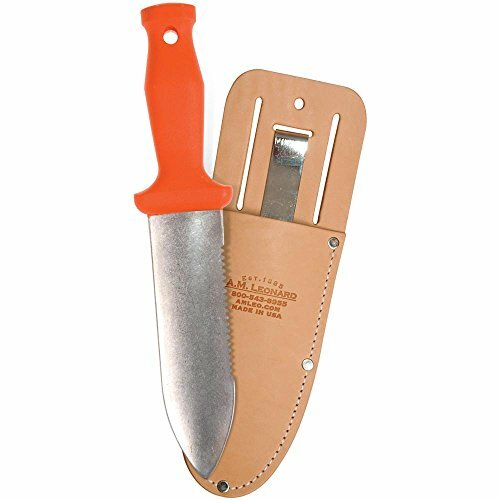 Our classic soil knife is made by one of the worlds finest manufacturers of quality steel tools. This 3-in-1 landscaping tool digs, cuts and saws; plus it excels at rock removal, weeding, planting, dividing crowns, and cutting roots. 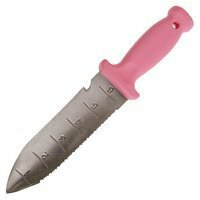 The 6-inch stainless steel blade has a tapered slicing edge with mild serrations on one side. The one piece molded composite handle is designed with a wide guard. Blade is 1-3/4 inches wide and 11-3/4 inches long; sheath sold separately. 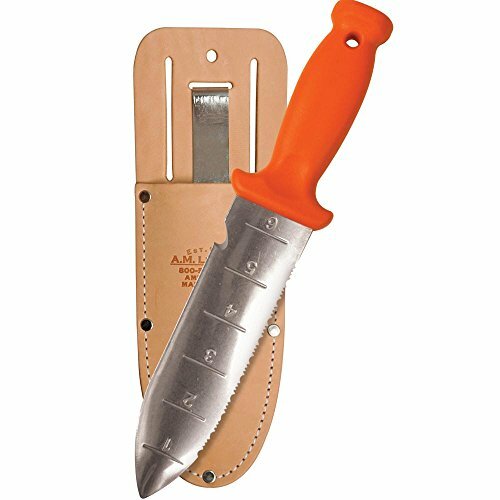 A new and improved soil knife based on the A.M. Leonard Classic Soil Knife. USE TO: divide plants, plant bulbs, flowers and herbs, dig out weeds, remove rocks, cut through roots, plant in pots, clean out cracks, cut twine and ties, and so much more! NEW FEATURES: Larger diameter hook opening to hang neatly after use, thumb-rest handle and wider safety guard for a more comfortable grip, Twine Cutting Notch, Depth Markings on Blade (inches), Extended Dual Cut Serrated Edge. 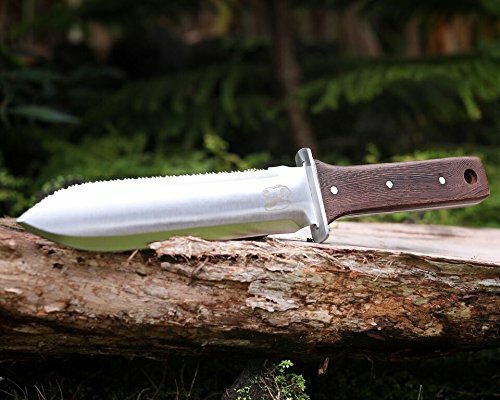 Manufactured from the highest quality, rust-resistant stainless steel and the blade is engineered to withstand over 300 lbs of pressure, for a lifetime of use. The 6-inch stainless steel blade has a tapered slicing edge, plus a sharp, deeply serrated side made for fast root cutting. Comfortable one-piece molded composite handle offers a more rounded grip and molded thumb rest. Blade is 1.75 inches wide, 11.75 inches overall length. Sheath sold separately. LIFETIME WARRANTY. Ship wt .5 lbs. A new and improved soil knife based on the A.M. Leonard Classic Soil Knife. We added even more features. USE TO: divide plants, plant bulbs, flowers and herbs, dig out weeds, remove rocks, cut through roots, plant in pots, clean out cracks, cut twine and ties, and for so much more! NEW FEATURES: Larger diameter hook opening to hang neatly after use, thumb-rest handle and wider safety guard for a more comfortable grip, Twine Cutting Notch, Depth Markings on Blade (inches), Extended Dual Cut Serrated Edge. Manufactured from the highest quality, rust-resistant stainless steel and the blade is engineered to withstand over 300 lbs of pressure, for a lifetime of use. The 6-inch stainless steel blade has a tapered slicing edge, plus a sharp, deeply serrated side made for fast root cutting. Comfortable one-piece molded composite handle offers a more rounded grip and molded thumb rest. Blade is 1.75 inches wide, 11.75 inches overall length. Save when you buy the sheath together with the knife! LIFETIME WARRANTY. Ship wt .5 lbs. Member tested and recommended by the National Home Gardening Club! LIFETIME WARRANTY. Perfect tool for master gardeners and a must-have garden tool! Our classic soil knife is made by one of the worlds finest manufacturers of quality steel tools. This 3-in-1 landscaping tool digs, cuts and saws; plus it excels at rock removal, weeding, planting, dividing crowns, and cutting roots. 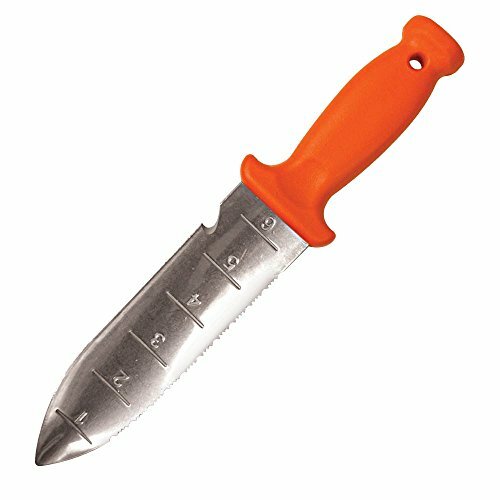 The 6-inch stainless steel blade has a tapered slicing edge with mild serrations on one side. The one piece molded composite handle is designed with a wide guard. 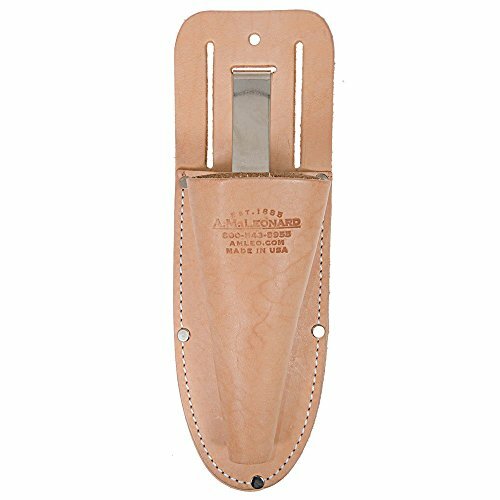 Measures 1-3/4 inches wide and 11-3/4 inches long; save when you buy the sheath with the knife! ***Features: Matte finish stainless steel. Shorter, milder serrations for root cutting. Larger grip guard. *** Customer favorite for years. 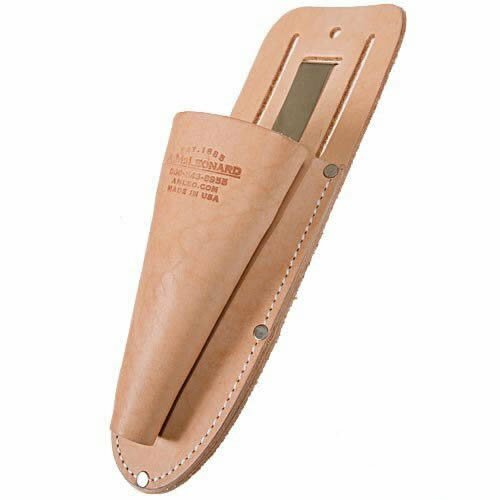 The A.M. Leonard soil knife sheath can fit the 4750 and 4752 Soil Knife. It is made of quality leather with clip-on action for safe keeping. You can keep it on a web-belt with other tools, then when you are ready to work, it is there for easy access. *Soil knives are sold separately. The Radius Garden Weeder features a patented ergonomic grip that provides more leverage with less wrist stress. A unique tool that really means business. 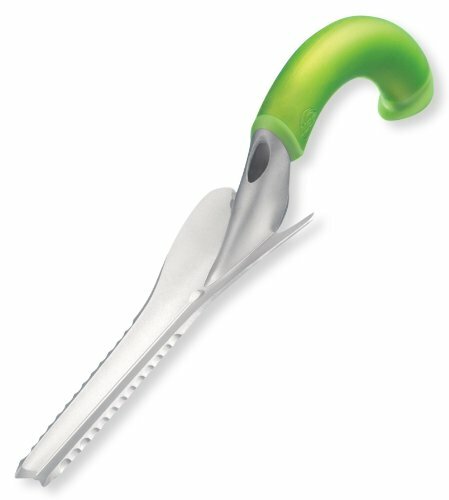 The aluminum blade has a sharp tip and serrated edges for weeding. Curved fulcrum provides leverage to help pop-out deep, tough weeds. A.M. Leonard Dual Soil Knife And Pruner SheathKeep The Two Most Popular Tools At Your Side With The NEW Leonard Dual Case. You`ll Be Prepared To Tackle Pruning; Flower Planting; Weeding; And More. Top Grain Leather And Quality Construction Will Last For Years. Fits The 4750 Or 4752 Soil Knife And Just About Any Size Pruning Shear. Attach By Belt Slots Or Spring Metal Clip.A.M. Leonard; Inc. Warrants All Its Tools Identified With The A.M. Leonard Lifetime Warranty" To Be Free From Material Defects For The Life of The Tool."